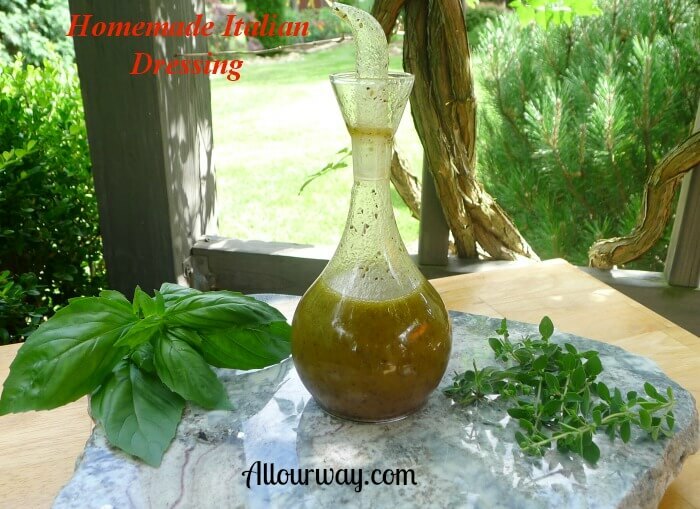 Our Homemade Italian Salad Dressing was born because we were so tired of store bought salad dressing . . . .
. . . .you know the kind . . . . it’s got a slimy texture . . . .
. . . .it’s got phony ingredients as long as your arm . . . .and it leaves a nasty taste in your mouth. We eat salad . . . .
. . . .every night! You’d think we’d get tired of salad . . . .but we don’t. We just couldn’t abide eating a salad and dribbling on a dressing that we just didn’t like. So we took ingredients that we do like . . . .
. . . .such as good extra-virgin olive oil . 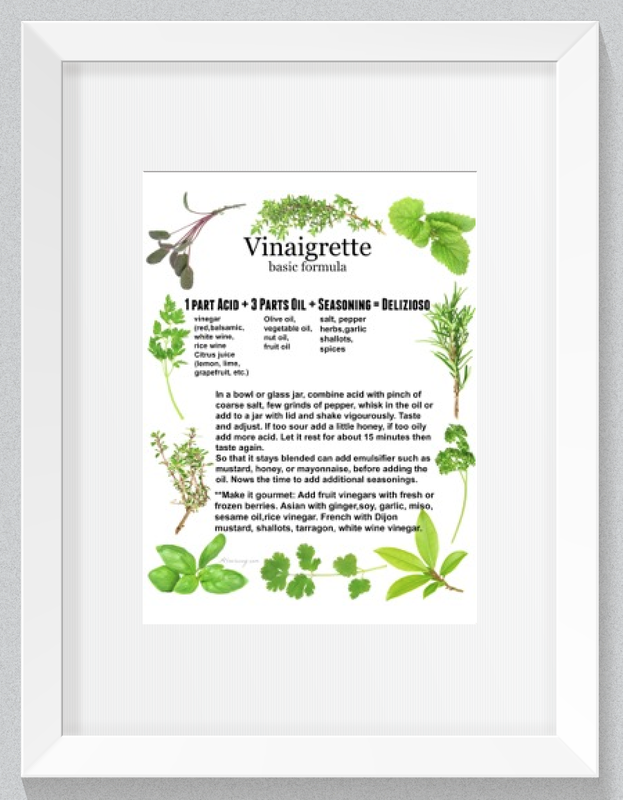 . . .white balsamic vinegar. . . .
. . . . and our favorite Mediterranean style herbs. . . .
. . . .such as oregano, basil and thyme . . . .
. . . .plus a tweak here and there of flavors we liked such as garlic and onion. . . .
. . . . and. . . . Ecco! . . . .
. . . . our Homemade Italian Salad Dressing – All Our Way was created. Start adding our Homemade Italian Salad Dressing to your salads. . . . you’ll be as nuts about salads as we are. And if you’re feeling especially inspired, use the Homemade Italian Salad Dressing as a seasoning sauce . . . .
. . . .like in pasta salad . . . .
. . . .or for a marinade such as in the Chicken Piccata recipe. . . . if you don’t have the plain yogurt. Another plus with our Homemade Italian Salad Dressing is that it doesn’t have to be refrigerated. This would make a perfect addition to take on a picnic . . . .one less thing to keep in a cooler. 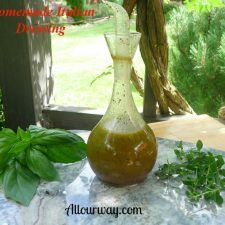 An all natural homemade dressing that brings an Italian flavor to salads and it doesn't need to be refrigerated. In a blender mix together the white balsamic vinegar, garlic powder, onion powder, salt, pepper, and Dijon-style mustard. With the blender on, slowly pour in the extra-virgin olive oil and mix thoroughly until well blended. Add the oregano, basil and thyme pulse once or twice -- just enough to blend. Let stand at room temperature for 30 minutes to let the flavors meld. Give the dressing a good whisk or shake immediately before serving. This would be a great addition to a pasta salad or used as marinade. We have used red wine vinegar in this recipe but we found it too acidic for our taste but you may like it that way. i’ve been searching for a good classic salad dressing recipe. will definitely be making this. thanks for the awesome recipe.